The Blendtec Wildside Jar is the best jar for the best outcome of your smoothies & Co.! Incredible. It's the jar that revolutionized high-speed blending. The WildSide+ features an extra-wide base and a narrow fifth "wild" side that helps create a faster, smoother blend. The Blendtec Wildside Jar Plus ist the Premium Jar and also the jar that comes with every Blendtec Designer model, and also the Blendtec Pro 800. The Wildside Jar ist the biggest jar for domestic use and has an enormous capacity of 90 oz: That makes a lot of smoothie! Especially great for families, so one blend could „feed“ four. The Wildside Jar was tested for commercial use before it was also available for domestic use. If it lasts long for businesses, it was definitelz ready for the home! It's the jar that revolutionized high-speed blending. The WildSide features an extra-wide base (The Wild Side, the fifth side) and a narrow fifth "wild" side that helps create a faster, smoother blend, especially great when you use frozen ingredients. The WildSide jar also features two vertical ridges on the interior walls to disrupt the blending pattern even further and accelerate the blend. The result? The fastest, smoothest blends yet. The Jar is easy to clean and the blade is not sharp at all! All Jars are made of Tritan and are free of BPA! Blendtec Jars are used for commercial purposes every day, in many smoothie bars and coffee shops, they produce 400-600 smoothies a day! 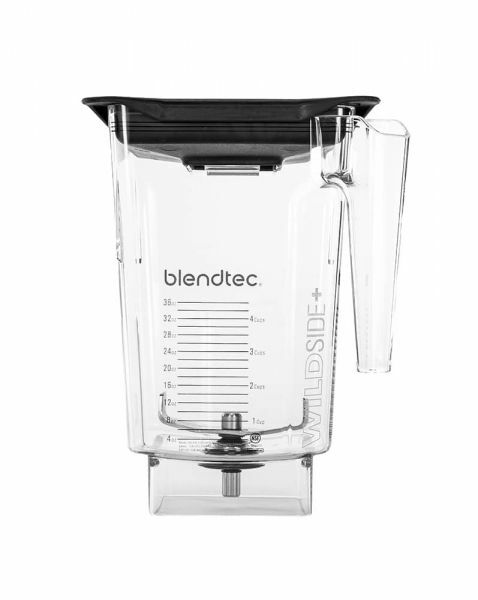 The WildSide jar combines with your Blendtec blender to maximize blending performance. Is used for commercial use for 12 hours a day, 7 days a week! Related links to "Wildside Jar"
Customer evaluation for "Wildside Jar"